Here will explain how to remove duplicate records or rows from a table in SQL Server or delete duplicate records from table in SQL Server. In previous articles I explained take database backup in sql server, covert rows to columns in sql server without using pivot table, substring function in SQL server, Replace function in SQL Server, how to delete duplicate records from datatable in asp.net. 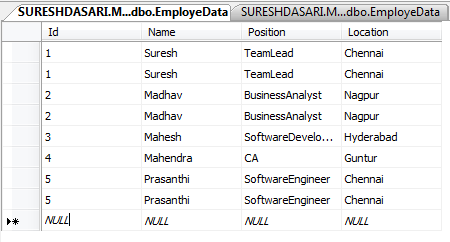 Now I will explain how to delete duplicate records from a datatable in SQL server. Actually above table does not contain any primary key column because of that same type of records exist. If you observe above table I added another column RowNumber this column is used to know which record contains duplicate values based on rows with RowNumber greater than 1. 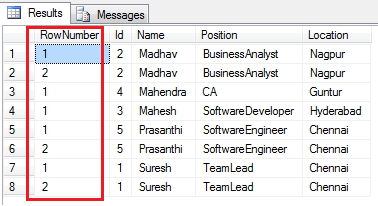 I have doubt , after execute the Query where is the RowNumber Column?? ,Previous table you marked by red color to the column of RowNumber after execute it, It was hided how that was Happen??? tempTable is the temperory result set created using CTE in sql which has Rownumber in the selection but EmployeData is the actual table in database. Hope it helps.